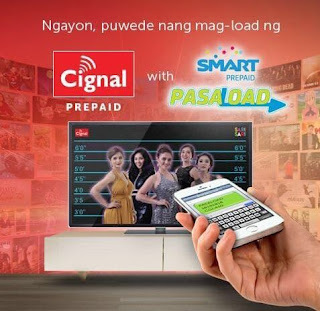 Loading your CIGNAL Cable TV is now made easy with the help of Smart. The signal prepaid box can now use the PASALOAD service to immediately load your account. This is the convenient way of loading as you don’t need to go to your nearest signal retailers. All you need is a Smart prepaid SIM card with a regular load, amount depends on your desired Cignal load denomination. This service works almost the same with regular Pasaload where your load is transferred to another account number. Transferring your load to your TV box is just a few steps, all you have to do is remember the keyword, amount, denomination and expiry date. Note: The amount will be credited to the recipient’s Cignal Account Number within 5-15 minutes. P1 transaction fee deduction from the pasaload sender. Wait for the confirmation message sent to your mobile number. You also get free text on every successful CIGNAL pasaload transaction, number of free texts depends on the amount you load. E.g. CGL50 – 50 free texts, CGL175 – 175 free SMS and so on.